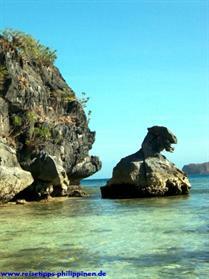 Linapacan is situated south of the Calamian Group (Busuanga and Culion) and northwest of the long Palawan main island. 1999 I been first time for 1 hour on the pier of San Miguel, it was a break on a regulary trip by a public boat from Coron to Taytay. Since that days I was planning to go there, if I would have anyone enough time in the future. 2009 it happens finally! Meanwhile they not have a public boat anymore, people told me the old boat was sunken some years ago! ... and really - before one can enter this almost untouched treasure - you have to pass an adventurous and dangerous journey, in small, sometimes overloaded bancas of locals or dealer. In Coron (town) at the southern part of the new land reclamation area (go from the market to the bus- and jeepneystation) you will find locals from Linapacan with their boats and you can apply for joining them (2010 they wanted 300 Peso per person). If the weather forecast announce strong winds, it will be better to do the trip on a later date, because outside in the Linapacan Strait, there will be already high waves by regulary wind. Personel I also don`t like to get into the night - it is a long trip and needs maybe 6 hours from Coron. If they not have a lifejacket for you on board, buy one in an outdoor shop in Coron, they selling them. I am not very scary, but on that trip I been already happy to had one! Then you have also to ask, to what barangay the boat will go. In Linapacan exists no roads, if you wanna move to another place, mostly you have to charter a boat. The main village is situated on the north eastern part of the island and the name is San Miguel. Since 2009 there is a small pension house with a common bathroom just on the peer (5 rooms - 350 Peso). The owner Dory is doing the best to fulfill the wishes of the guests, she helps you to organise boats for visiting the surrounding islands and she let cooking all meals for reasonable prices. This is the only occassion to get food (but a good one)! Her husband is doing once or twice the trip to Taytay and he delivers rice, beer and all other products for the daily life (and that is also the second possibiliy for traveling to San Miguel). The other village where you could arrive is Maroyogroyog, it is around 1 hour by boat from San Miguel in a deep bay at the north western part of Linapacan. They do not have a public lodge, but if you asking the boat owner, who is going there (about his employees), maybe he offers you to stay in his big privat house on the peer (and they can also cook for you). But for me the better base in Linapacan is San Miguel, because the most island-jewels are closer to reach from there, like "Patoyo", "Elli", "Mephdet", "Ariara", "Inapupan". 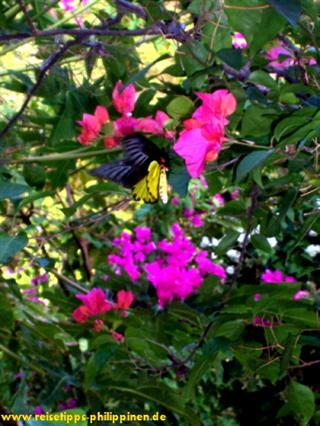 The charme of Maroyogroyog is the separation of the rest of the world, foreigner are not seen there many times before. Inside the barangay they still have high bamboo fences almost completly along the streets, like in the old times. Theoretically one can travel also direct from Manila with a boat (picture on the left side), but I recommend this adventure only for people who like to extend their personel limits. In San Miguel you can snorkel very well east side of the peer (150 meter to the reef edge), another good place is behind the cementary on Elli Island. There is an exciting channel to the main island for discovering. At that strategic place it is possible to climb - for sportive people - to the rest of a spanish watchtower. The japanese should also use this place in the IIth world war. Then you can discover also some caves along the coastline, better you bring a guide and a good flashlight. 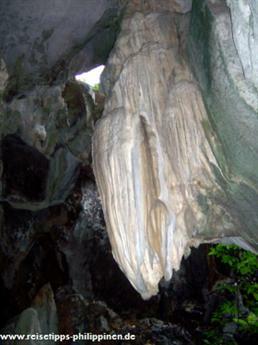 A bigger cave for exploring, is at the backside of the southern part of Elli island. 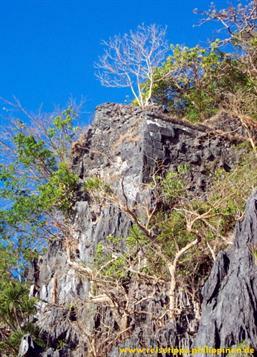 Hiking is also a good activity on Linapacan, there are no cars outside San Miguel. One destination could be two beaches further north on the coastline. At the northern end of the village, before the spring - take the footpath up the hill. 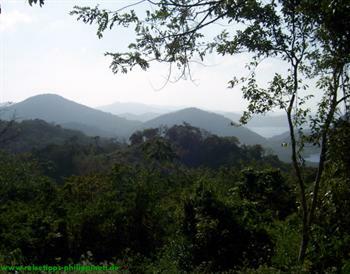 You will passing plenty of kasoys (cashew-nut trees), and you reaching another small Sitio (small village) after some time. Here you can follow the beach and later you see, after some cliffs and stones, a small rocky island. 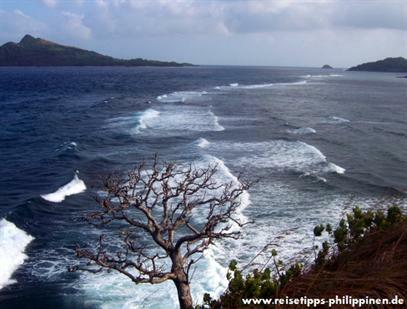 If you climb the hill you have a good view to the surrounding islands and frequently to the stormy waves. Another occasion would be to follow the street up to the western mountains. On the top there are 2 fences, which stop vehicles to continue, if you follow the path, you come to a way through the forrest up and down the hills, around 2 hours later it ends at a big garden. An old spanish fortress - forgotten from the history - you find around 45 minutes by boat from San Miguel in another big bay at the north western area of Linapacan. 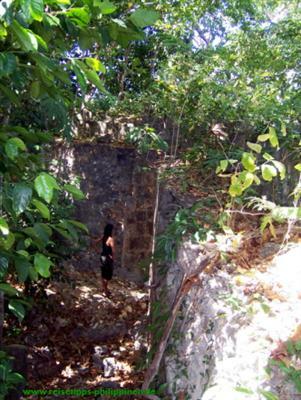 The bay is base of a pearl farm business, the fort is covered all over with plants and trees. A guide is necessary, you will not see the walls of the fort, even if you just 100 meter away. Patoyo is just on the (eastern) opposite of San Miguel, many nice sand beaches and you can go there also without risk (and inexpensive), if wind and waves are strong. If you walking up the mountains (no path - just crossover) you will have a very good view about all the landscape. 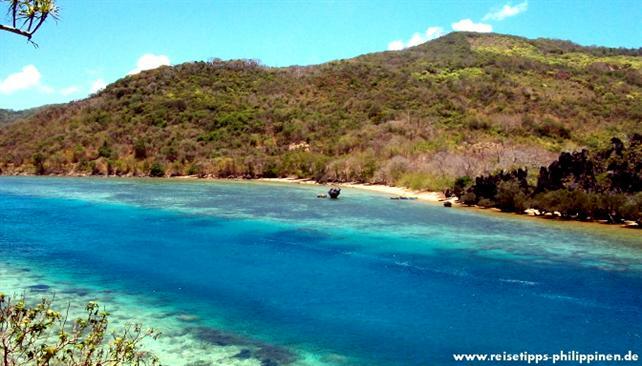 Very good snorkeling at the southern beach, and with some reservations, also in the next bay on the southern coast. So - i fear, it will be now not possible anymore to ask for snorkeling at the house reef, which would be really worth a visit, because they will protect their "special guests" from outsiders! Inapupan (pic upside), 30 minutes from San Miguel. I recommend to take a closed banca - regulary strong waves. Dream beaches and an original old fishing village are waiting for discovering! Cagbatan (Malbutan), private owner. Another very nice beach, the island is also mostly surrounded by high waves, snorkeling could be better. Nice rock formations, the owner (not living there) does not like visitors. I can understand that you see now all over Palawan more and more posters: "Palawan is not for sale!" Elli and Mephdet are situated just south of San Miguel. I was telling you already about the caves and the ruins of the spanish watchtower, also about the deep channel to the main island of Linapacan, which is good for swimming and snorkeling. A flat channel seperates Elli from Mephdet island, it is not deep, but sometimes you will find there a very strong current. At the eastern coastline of both islands you could find some very nice beaches. 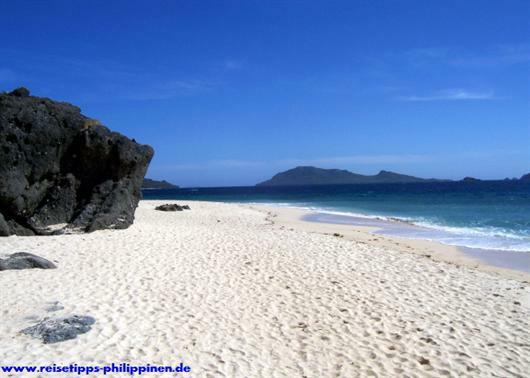 In the south of Linapacan island you would find the barangay of San Nicolas, because I not yet visited the place, I can`t give you further information! Maybe I should tell you some warnings about traveling to Linapacan. You can find there a lot of beautiness and adventure, but making there a holiday cost you some efforts! Energy is only available from 6 o`clock evening to maybe 2 o`clock in the night. The weather will be very hot or you have to expect a strong wind. There is no hospital or doctor on the island - so go there only if you bring a good health! 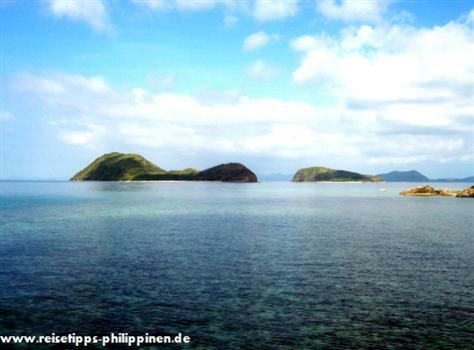 The boatride from Taytay/Palawan needs around 8 hours and you would traveling through another paradise of islands. Mostly the boatmen take the western route, because of fewer wind. 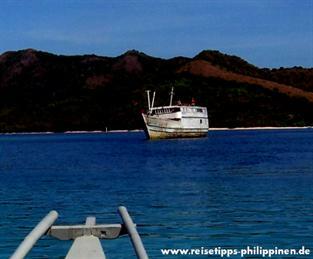 The trip from Coron/Busuanga needs 4 - 6 hours (depending on the motorpower and waves), you pass also many exciting islands. 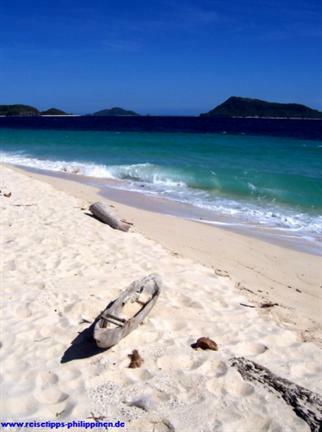 If you charter an own boat, it`s a good idea to have a break for snorkeling, maybe at the island of Binalabag. 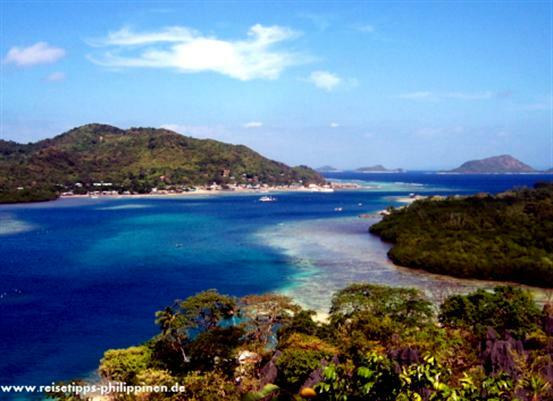 In Decabaito, first island south of Culion und north of the Linapacan Strait, you can find a big barangay.